Includes one (1) FemtoBeacon coin, a FemtoBeacon RF dongle. A 3D printed (PLA) case for your FemtoBeacon Coin. Allows you to power your coins over USB power lines, or use a coin in USB HOST mode. Think of it like an electric cochlea. Self balancing robots, motion processing, and more! Optional. One (1) FemtoBeacon coin 3D printed case. One (1) hour Setup support is always included free of charge, if you need it. We recommend the USB OTG cable and Adapter. The cable and adapter allows you to power your device off a USB Charger battery, or have the coin act as a USB HOST device! The FemtoBeacon coin, RF dongle, and code are 100% Open-Source. We are continually adding new examples, including support for VR integration (Unity3D, UE4). You can stream real-time wireless IMU and RF data to any machine. We even have examples for Android/iPhone on the way! About 18mm in diameter (antenna area adds about 4mm of length to one side). 100% Arduino compatible. Sketch upload via USB, or Atmel ICE programmer. Omnidirectional SMD antennas with ~30ft (~9.144m) range. Accepts up to 10V via USB Port, or VIN pin. Outputs 3.3V on 3V3 line. Integrated High Speed USB. Coin is USB HOST mode capable. Runs at 48MHz. The chipset is ATMEL SAM R21E (ATSAMR21E18A), is Arduino compatible. Coin: Precision Altimeter (MS561101-BA03) on I2C. See datasheet. Coin: 9 Axis IMU (MPU-9250) on I2C. See datasheet. Can generate an internal 96MHz Fractional Digital Phased Locked Loop (FDPLL)! Built-in RTC (Real-time Clock). 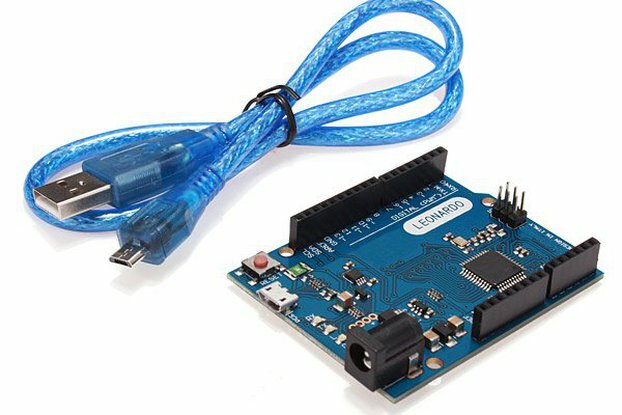 See example Arduino sketch for sleep/wake! ARM Cortex M0+ at 48MHz, can be configured to provide an internal 96MHz Fractional Digital Phased Locked Loop clock source. Input voltage 10V max (via USB or VIN pin only!). Outputs 3.3V on the 3V3 line. Operating voltage is 1.8V - 3.6V, can be supplied via 3V3 line. A small LiPo can easily power a coin (continuous transmission) for hours on end. Using sleep mode extends battery life significantly. 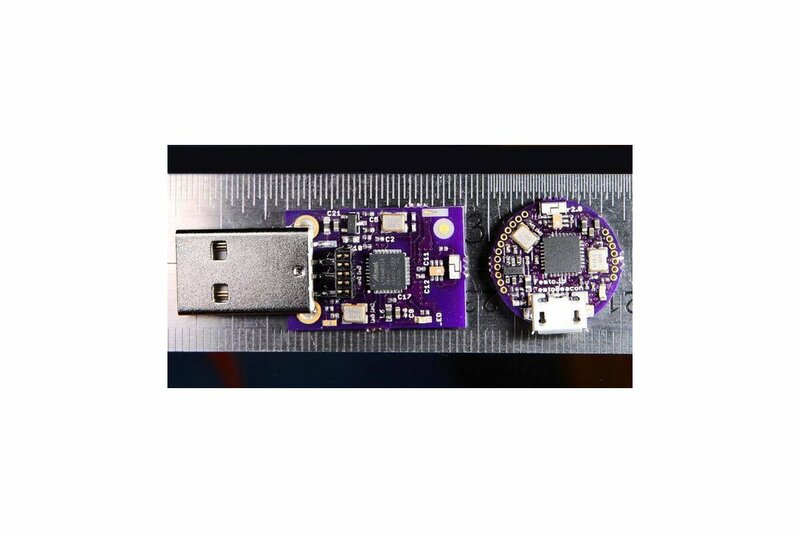 FemtoBeacon Coin is ~18mm in diameter (plus part of USB port and antenna area). up to two (2) I2C sets of pins. USB+ and USB- pins broken out. Up to four (4) GPIO digital pins. FreeIMU-Updates library, see FreeIMU.h for config! We are incredibly grateful for all of the FreeIMU community's hard work. We wanted to give back to the open source FreeIMU community by providing a 100% Open Source platform that would replace the original FreeIMU board. We hope it proves useful in the fields of physical computing, wearables, and robotics. Our design is provided as an EAGLE PCB schematic and board (4-layer). It uses 0201 components (two sided), but is still something you can assemble by hand. 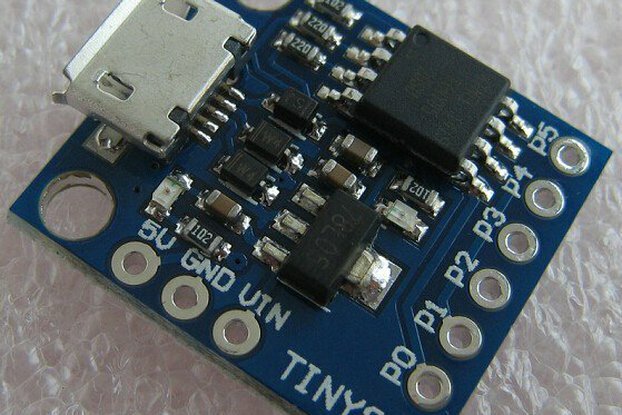 It is the smallest wireless (open source!) IMU in the world! Not even the Curie module is a match for this design. Our design is 100% open source, 100% Arduino compatible, and AWESOME for projects where precision, weight and size are critical.